It's fun to decorate a deck. This outdoor design project offers the opportunity to turn your imagination free. There are many styles and types of deck uses that you want to explore, such as a backyard retreat or a deck dedicated to outdoor dining. Consider your family's needs for this space and how you want it to be used. This covered deck features an L-shaped wicker couch, side chair and coffee table. A garden design like this takes advantage of being surrounded by the backyard wall and various plantings. A covered pergola with a retractable canvas is supported by columns. Spotlights overhead and up-lighting from the walled garden behind the deck add a romantic touch for evening use. A black wicker urn filled with colorful purple flowers and greenery anchors one corner of the deck. The coffee table features three silver bucket pots filled with plants. Two light gray votive ceramic holders feature heart shaped cutouts. A pair of hanging baskets with cascading foliage grace one end of the pergola. You can recreate a backyard retreat and add your special touches. Shade flowers, such as impatiens, begonias and alyssum in different colored pots of varying sizes and heights will add color and texture to the deck. Dark, medium or white wicker furniture will come to life with red or yellow floral cushions accented with colorful throw pillows. You may prefer solid colored cushions with patterned throw pillows. String lights can always be added for festive occasions, suspended between the columns. Choose from bulb, caged lights and cafe light strings. A modern deck design that features two adjacent areas of activities becomes a social haven. A conversation area can be created where guests aren't sitting directly in the sun. A covered deck will afford protection from the sun. If your deck isn't covered, then provide shading with a large umbrella, shade sail, awning or pergola. If your deck is partially underneath a shade tree, set-up the conversation section here. Your guests will enjoy the natural shade and pleasing green-leaf overhead canopy. Add built-in planters to give a hedge effect with tall shrubbery. 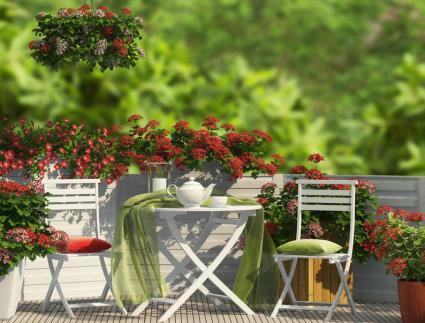 Set several pots filled with colorful flowers on tables, plant stands and the deck floor. Lush tall houseplants can be brought outside to enjoy the summer, too. Don't forget the beauty an outdoor area rug can give to this space. Complement the conversation grouping with a conveniently located adjacent bar for a great party/social layout. Guests will naturally flow between the two areas. A bar with wheels is an excellent choice since it can be moved when not needed or more space is needed. Add barstools that match the bar design. A two-tier cart is a great addition to any bar for extra ice and drinks. Opt for a cart with wheels that can be rolled in and out of the house to replenish the bar with supplies. Locate the bar so the outside wall of your home is behind it. Add a few shelves on the wall or an outdoor metal baker's rack for additional storage and decorative display of glassware and accessories. Use overhead lighting, such as paper lanterns and string lights. Tube lighting can be attached underneath the bar top and along the bottom of the bar for a nice effect. Choose colored lights for a more dramatic effect. An outdoor ice bucket on a stand is a great addition for wine and drinks. It will keep the bar top clear for guests to use. Don't just set a picnic table underneath a shade tree. Build a deck and then make this extra special with a customized picnic table or elegant dining table and chairs. Use your imagination to make this dining deck unique. 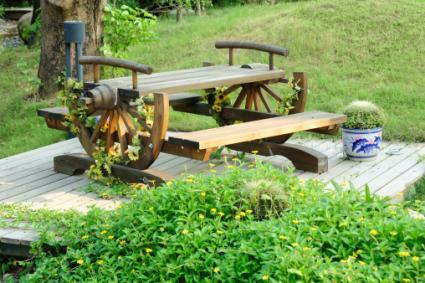 A customized picnic table, such as a unique western style, is just one of the many design options for a dedicated dining deck. This design is fun and depicts the historical significance of the wagon. Place the picnic table at an angle to give the illusion of a larger space or to emphasize the table design. Keeping with the western theme, add a few cacti along with other plants, being careful not to place them too close to diners. This wagon wheel design takes advantage of the spokes allowing ivy to vine around them. Use western style flowers in pots, such as sunflowers and bluebonnets. Landscape around the deck with shade plants. You may prefer to add large potted plants on the ground along the perimeter of the deck. 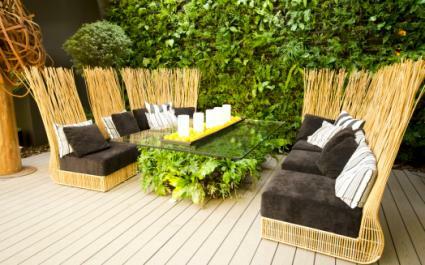 Create a plant wall or two for a more intimate setting with ground level potted plants that can be moved. Add battery-operated string lights to some of the plants. Solar lighting can also be used to highlight this area. Use tree limbs to suspend overhead old-fashioned bulb light strings. An outdoor rug with a star design adds depth and repeats your western theme. If your deck is attached to your house, you can use various western themed outdoor wall art. This deck design features a set of white folding wood table and chairs. It's easy to create a similar intimate setting in a corner that might otherwise be neglected. Window boxes attached to the white railing are filled with deep red flowers. Hanging baskets continue the color scheme. Ceramic and wood pots as well as urns of different sizes and shapes overflow with various deep red flowers. The chair cushions are complementary colors. A deep red is contrasted with a pale green. A matching pale green gauzy tablecloth can be used to set the table for teatime, complete with a white teapot and column candle. 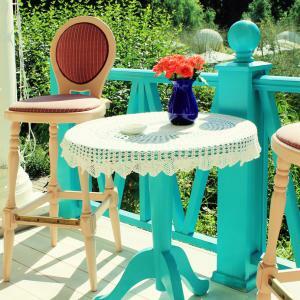 You can use this idea to create other types of quaint intimate corner vignettes on your deck. Board game corner: Use a small table with two chairs for a chess, backgammon or checker board game area. Conversation corner: Set a pair of matching chairs and a small table for a quiet conversation area. Add an umbrella for shade if needed. Kids corner: Place a child-size table with chairs for a kids area along with a lidded toy box. You can create a fun eclectic deck design by collecting various pieces through attic and garage sales. You can then upcycle them with a new coat of paint as well as embellishment, such as stencils. Don't stop here, turn your eclectic style on the deck itself. Instead of a humdrum white or stained deck railing, opt for bold color like aqua blue. Unify this color choice by painting a wood table the same color as the railing. Cover with a hand-crocheted tablecloth or opt for a colorful one. A pair of old bar stools can be repurposed for a bistro look. The blue vase and orange roses take advantage of the design power of complementary colors. The natural greenery beyond the deck backdrops for a complete look. Add hanging baskets with cascading colorful flowers and greenery. Floor candelabra with colored column candles are ideal for an evening glass of wine. Go with a deck design that is exotic and unique. This can be a cultural or ethnic design style. Select an island exotic style of furniture to be the centerpiece of your design, but don't stop there. Keep the focus on exotic as you layer your design. A simple glass top dining table can become a mirror of the tropics by placing lush potted plants underneath. Make sure that the table extends at least one-two feet over the plant base so guests can dine in comfort. Select plants that don't attract pollinators. Place thick comfortable cushions in the chairs along with a lumbar pillow and a throw pillow so guests can adjust back support accordingly. Select a colorful tray to hold column candles for the evening meal. This can be set in the center of the table. You may need more than one tray depending on tray size. Add various tropical potted plants around the deck, working in groups of three or five of various pot sizes, shapes and colors. Create a living wall system to backdrop an exquisite dining area. Use small potted fruit trees, such as dwarf banana, lemon, orange and columnar apple to further decorate deck and give it a tropical flair. Select an outdoor sculpture or two. Choose one made from an exotic wood. Uplight the sculpture(s) and surrounding plants for a dramatic touch. Hang paper lanterns over the table (far from candle flames) or a candle chandelier. Now that the dining area is completed, it's time to turn your attention to a seating area. This can be as large or as small as you wish depending on the deck size. Select rattan or wicker tropical style furniture. Choose colorful cushions, throw pillows and lumbar pillows. On the outside wall of your home, add outdoor wall art, such as wood or metal. You may prefer paintings that convey the tropical feel, such as sandy beaches with palm trees. Highlight exotic plants in colorful pots placed on the floor and smaller plants on end tables or coffee table. A garden stool can be used for a table or a plant stand. Place a couple of ceramic, wood or metal figurines of wildlife in-between floor plants and smaller ones on the coffee table, such as parrots, macaws, capuchin monkeys, tree frogs or larger ones like a jaguar. Outdoor wicker or rattan lamps with colorful shades can grace end tables or a sofa table. A floor lamp/mister combination will be appreciated during sultry summers. A pergola deck offers several opportunities to make this an exquisite centerpiece. A stylized decking will enhance this design as will a three-sided four-foot wall. 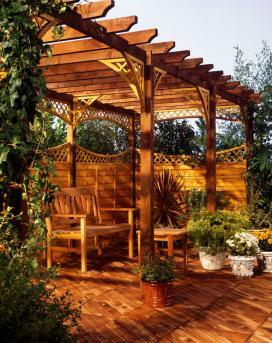 You can use a pergola section as a deck for an intimate conversation area or a dining area. You may choose to take advantage of the space and create a sleeping area for afternoon naps or outdoor sleeping on summer nights. Intimate conversation area: Add a loveseat, pair of chairs, conversation grouping, glider or a swing. Dining area: Choose your style, such as rustic, Asian or country. Sleeping area: For afternoon naps or summer nights add a hanging outdoor bed, daybed or chaise lounger. Board game fun: Depending on space, set up one or more tables for family board game fun. Enclosing the pergola on three sides creates an intimate and private space. This can be a deck unto itself or used on the end of a larger deck. Adding stylized lattice trim to the pergola creates a pleasing decorative look while still serving a utilitarian function. String lighting: Bulb or another style of string lights can be strung overhead to provide a romantic touch. Vine plants: Choose an evergreen vine, such as ivy or a blooming rose vine, for this design planting. Wall art: Select a focal piece of outdoor wall art or two to coney your personal style. Hanging baskets: Each oval lattice is ideal for a hanging basket of flowers. 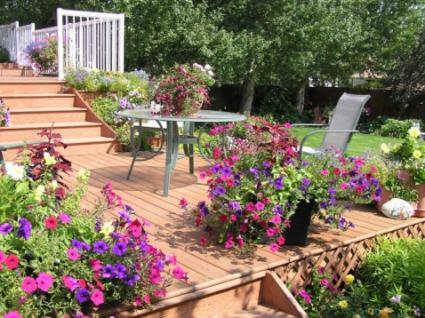 One of the best ways to decorate a deck is to use lots of colorful flowers and various plants. You can optimize deck space with vertical plantings. This is especially helpful for multi-level decks. Place small plants on steps. Stagger the plants every other step and alternating sides so you don't crowd the steps. Set these just as you would any type of layering design in a room. Carry the plants from the bottom of the steps allowing the plant sizes to increase as you reach the next deck or landing. On either side of the steps, you can use stacked planter systems filled with a variety of flowers. Use various planter heights and fill until overflowing with blooming flowers. These can be placed around the deck in groupings of three or five. Add various garden art placed among the flowers. Hanging baskets can be suspended from shepherd hooks sunk into the flower pots. Attach shepherd hooks to the deck walls. Attach different heights of shepherd hooks to the side of the step risers (point hooks facing away from steps so flowers line outside of steps). Deck planters that attach to deck railings is another way to add plants to your deck. 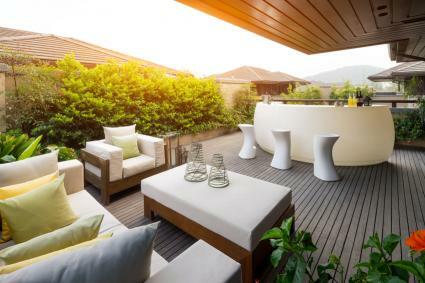 The right outdoor furniture will make your deck inviting, regardless of your style. 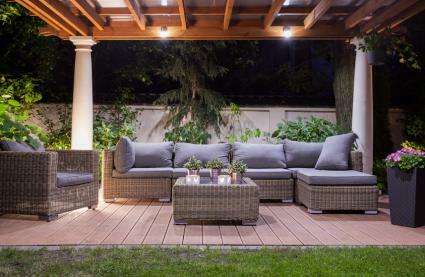 Be sure the furniture you select is designed for outdoor use. You may prefer rocking chairs, sofa/loveseat/chair groupings or glider furniture. Select a furniture design you love and will enjoy using in colors you find enticing. Wood: Teak or cedar are two of the most popular woods used for outdoor furniture. Set with crisp white cushions and lemon-colored pillows and you're ready to entertain. Add red accessory touches for a little color pop. Wicker: Dark, medium or white wicker furniture will come to life with red or yellow floral cushions accented with colorful throw pillows. You may prefer solid colored cushions with patterned throw pillows. Metal: Powdered metal furniture resists the elements and comes in several finishes that include, patina, bronze, wrought iron black, and white. Landscape lighting: Place landscape lighting around deck, step lights and railing lights. Mirrors on wall: Make a wall gallery using mirrors, colored plates and corbels to support candles. Wall art: Feature kids' art in the kids' section of your deck or place on the wall along with outdoor metal art. Container garden: Plant a few vegetable plants and use them for outdoor walls to divide zones or provide privacy. Built-ins: Build planters with benches between them along the perimeter of your deck. Outdoor fire pit: Purchase a fire pit or make one from a terra cotta bowl filled with sea glass and a can of gel alcohol. Plant vignettes: Decorate corners and create focal points with a plant vignette using different heights of potted plants with planter stands and tables. Work with odd numbers for best design optimum. 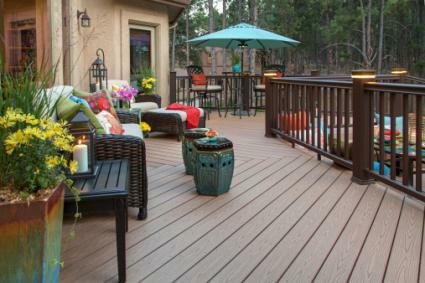 Take the time to plan how you wish to decorate your deck. Consider all the activities you need to accommodate and then shop for your ideal furniture and accessories. Following a design plan will save your time and money.